The year 2018 marks the 40th anniversary of having the great privilege, and the challenges, of owning the Lochnagar Crater. “In 1978, the Lochnagar Crater was in danger of being filled in, as the smaller sister mine Y Sap had been in 1974. When news of the purchase emerged, many dozens of veterans with personal experiences of the Crater got in touch. That was amazing. Read more about Richard in this March/April 2017 article. Over the years, the vision of its true role evolved and today, with the launch of the new Lochnagar Crater Foundation, it is clear. In this centenary year of the ending of the Great War it is easy to look back a century ago and focus entirely on the events of those four terrible years. And to reflect that, for the British, the war ended exactly at the place where it began. And more poignantly, that the first man and the last man killed are buried yards from each other in the same small cemetery. We now also have to look forwards to the coming decades and ask ‘Should Remembrance evolve and, if so, how can Lochnagar play its part in changing the way we honour those who fell? Of course Lochnagar, this vast, awesome ‘wound’ on the battlefield, has to be carefully and lovingly preserved for future generations, to silently bear witness as a powerful symbol of ‘man’s inhumanity to man’. But Lochnagar is much more than that. I, and other like-minded people believe the Crater has the power to speak to each visitor in a way that few memorials can. Our vision is set out below. Not everyone will agree with it of course, and that is their right, but whilst Lochnagar is privately owned the integrity of that vision will never be compromised by personal profit or publicity. 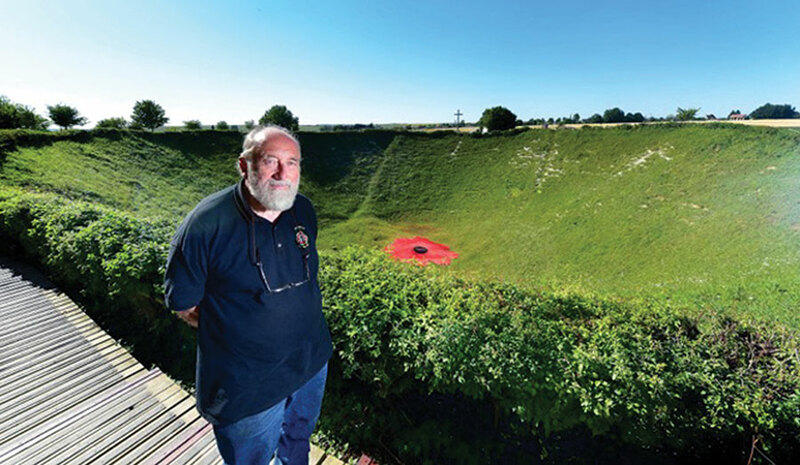 This is how the six-steps of The Lochnagar Crater Foundation will unfold in the coming years, with the Foundation and its Trustees ensuring its long-term future. It is, and always has been, a journey and its next chapter is as bold and challenging as the first. PRESERVATION – It is vital that Lochnagar is carefully preserved and, for that, we have to pay tribute to the dedicated volunteers of Friends of Lochnagar, who help maintain the Crater so that visitors can appreciate its truly breath-taking size and its unique panoramic views of the July 1st battlefield. Lochnagar receives no official financial support from governments or organisations, with all funds being raised entirely from donations. INFORMATION – We always encourage research and the gathering and sharing of facts and memories relating to Lochnagar and also to the wider aspects of that conflict. COMMEMORATION – We hold annual Remembrance Ceremonies on the anniversary of the creation of the Crater on 1st July and also on Armistice Day, 11th November. All are welcome. INSPIRATION – Lochnagar is far more than just a traditional battlefield memorial. Countless visitors over the past 40 years have said that the powerful and poignant emotions evoked by their visit have given them an insight, perhaps for the first time, into the impact of that war, especially within generations of their own family. The ‘wound’ that is Lochnagar invariably speaks to the ‘wound’ that is within many of us, the result of events of a century ago. And these insights can help us understand any conflict, past, present or future. TRANSFORMATION – This is the key part of the Lochnagar Vision. Is it enough to simply remember for one day a year? We believe there is another way of honouring those men and women of all nations who strove for peace and who fell in that war. And that is by each of us changing the way we live today – by bringing a little more peace into our lives and into the lives of those around us. RECONCILIATION – Lochnagar has the power to inspire and bring together like-minded people of all nations who wish to honour and remember the fallen in a spirit of peace and goodwill. ‘I vow to honour all those who fell in the Great War by striving, each day to make the world around us a place of more kindness and compassion; understanding and tolerance; forgiveness and reconciliation. When did you buy the Crater? On July 1st 1978 I was handed the ‘deeds’ to the Lochnagar Crater in an informal ceremony at the site. This followed years of searching and negotiations – not just with the vendors, who were most helpful throughout but mainly with the Bank of England who were not helpful as they said the sale of the site ‘created a dangerous precedent’ and added a 50% surcharge to the price!’ This was decades before buying property in France became commonplace. The day after the sale, the BBC did a small piece on the radio news about it and the result was that I received over 600 letters in a week, with about 150 from veterans who had personal memories of Lochnagar. Getting to know them all, via personal visits, letters or telephone calls was one of the greatest privileges of my life. With friends, we managed to bring several over to the battlefields and to hear their evocative experiences first-hand was priceless. How much did you pay for the Crater? I am often asked how much I paid for Lochnagar (especially by the young). I have never told anyone, nor ever will. All the accountants and solicitors involved are no longer with us. All I do say is that it was the going rate for a hole of its size. I know you’ll agree – compared to what happened there it is just not important. In the summer of 1915 the British troops took over the trenches from the French Army on much of the Somme. At La Boisselle there was a battalion – the 7th Gordons, formed mainly from Deeside with many soldiers former workers on the Balmoral Estate. An officer went round naming all the trenches after familiar landmarks and towns, with Lochnagar being the name of the mountain not far from Balmoral. How many men were killed by the explosion? We will never know for sure although in the 1980s a veteran recalled entering German dugouts close to the south-west corner of the site. Inside were scores of seated German soldiers all killed by concussion from the explosion. The dugouts were sealed and remain there still. The Crater itself was used as a temporary resting place immediately after the battle with many hundreds of bodies placed in it before re-burial elsewhere. Inevitably, with the constant heavy shellfire focused on the Crater some bodies were covered by debris and are there to this day. In 1999 the remains of Private George Nugent of the Tyneside Scottish Northumberland Fusiliers were disinterred and today a small cross commemorates him and the countless others at Lochnagar who have no known grave. Yet more lives were lost when the Crater was fought over again in the Second Battle of the Somme in 1918. How did you come to buy it? It was 3am, I was sat in the corner on my bag, very anxious, having recently been the victim of an attempted mugging and assault. I took out the only book I had with me which was John Masefield’s superb ‘The Old Front Line’ and, for some reason when I came to a few lines about the Crater the hairs on the back of my neck stood up. I returned to New York that night, next day flew to London and the day after that got in my battered old Hillman Imp and drove to the Somme. I didn’t know anything about it, didn’t have a map but headed for Albert. I got lost, went up a lane to some high ground to get my bearings, climbed a fence to a small ‘hill’ and to my amazement found myself at the Crater. It had ‘called’ me over 4,000 miles in four days. In the following years I returned time and time again and invariably it was deserted. I found it a magical, poignant place, rich with memories and atmosphere. Never thinking I would one day own the Crater, I decided to buy a tiny piece of the Somme battlefield, anywhere, simply just to own a ‘corner of a foreign field’. I wrote over 200 letters to mayors, solicitors, newspapers etc, stating that I wished to buy a small plot of land on the Somme Battlefield. I went to a prestigious firm of solicitors in Westminster and they sent out the letter on their hugely impressive engraved letter heading – the thinking being that if someone thought I was both mad and rich it would cause something to happen but nothing ever did. In the meantime I was regularly visiting Lochnagar, often travelling overnight on the ferry to save money and arriving at the Crater just before dawn. Then one day, to my amazement I got a letter from a notaire saying that he had seen one of my letters written over a year before and had in his office a farmer who wished to sell me a piece of land. It was Lochnagar. The farmer was in the office to get permission to fill it in, a fate that befell its sister mine, Y Sap two years previously. The sale had to be done in utmost secrecy and took a long time but I consider myself enormously blessed and privileged to be its ‘steward’ for this stage of its life and, along with many dear friends to help preserve it for the next generation.